Activators come together for National Imbizo - Activate! Paul Mabote is a member of the ACTIVATE! Change Drivers Network. Activate! 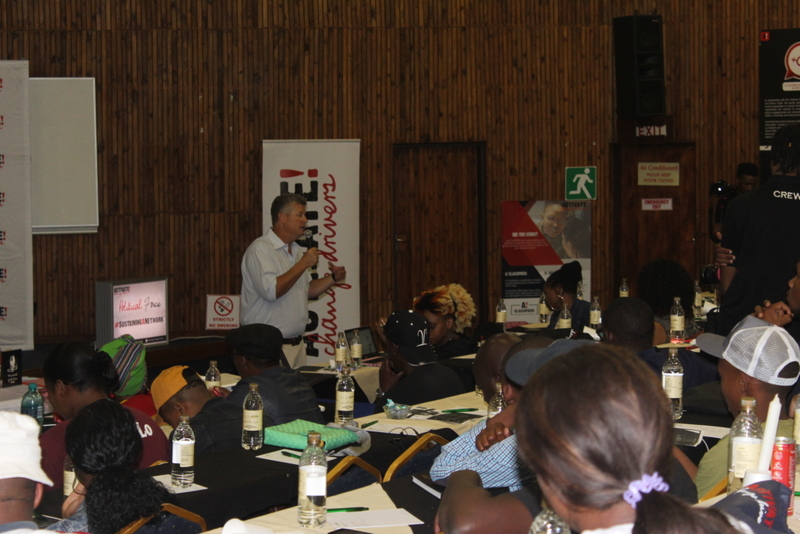 Change Drivers CEO Chris Meintjies started the proceedings off with a powerful address. It began with an invitation to Activators to realize that “there’s a magic to being part of a bigger family.” He later highlighted the importance of providing and receiving value and expressed his pride in Activators for contributing to a different narrative for the country. Chris painted a picture of the dire economic situation that our country is in currently and elaborated on how the Activate! Network could become a formidable social, political and economic force. During his presentation, Mr Meintjies also asked everyone to imagine what South Africa looked like in terms of young leaders, either like a forest, or like a desert. He likened SA to a forest where leaders have to grow as trees, find firm ground to plant their roots and sunlight to help them grow. He said that Activate’s objective was to help these leaders find fertile ground and assist in their continuous growth. Chris concluded by stating the importance of always starting with a vision and explained Mindsets, Capacity & Impact and (No) Interconnectedness as ways to build leaders with vision. (Shhh) He also alluded to the possibility of there being a 10 year celebratory Imbawula gathering next year. On the panel, they had 3 of the amazing Activators featured in the A! Heroes Book. Nozipho Zungu who runs her own spa and who identified her grandmother as her hero, Sam Nkogatse, an author from Limpopo who said that young people are his heroes and Xolani Ngobozane, who started the #DonateASchoolbag initiative and believes that to make a difference, one must create a solution and trust that solution. Helga Jansen Daugbjerg, programs director in Activate’s operations department was next on stage. She shared some interesting statistics about the A! Network, including that 60% of Activators have at some point engaged with their local councillor. She gave a brief illustration of what the A! Leadership team looks like and introduced members in the Provoke, Connect, Capacity Building and logistics departments, among others. Next, Tebogo Suping who is Activate’s Capacity Building Department’s manager led a very enlightening exercise. She asked everyone to, with a candle in hand; introduce themselves and state one thing they are passionate about. She then asked the first person in the first row to ignite their candle and to pass on the flame to the person next to them, so on and so on until the whole room was candle lit. That, she said, was to illustrate the fact that your greatest asset could be the person sitting next to you. Monitoring and Evaluation manager Cephas Mutami delivered some key statistics in what was the last but not the least of the presentations for the day. He highlighted what he called the constant threat of poverty that stalks even the working class of our population, as a result of depopulation and a less than desirable state of the economy. According to Mutami, 27% of the South African population is considered non-poor, but vulnerable to poverty. Shortly after dinner, member of Activate’s Provoke team Nhlanhla Ndlovu facilitated a debriefing session which gave Activators a platform to reflect on what they had learnt throughout the day. “What is your name and in one word, what do you bring to the A! Network?” Nhlanhla asked a group of Activators who stood in an arranged circle. The participants had to take turns to answer the questions while tossing around a roll of string, thus creating a web like pattern between them. He proceeded to snip away the links one by one, demonstrating how the loss of more vital connections can lead to a weaker network. “In my opinion, we need a communal vision for the network to be effective; something which will benefit us communally, and which we will all do something in our respective spaces to work towards achieving.” – Bongiwe Ndlovu, 2013 Activator.